Patriot Prayer and No to Marxism cancelled their San Francisco Bay area rallies this past weekend due to the threat of violence from the left, but that didn’t stop Antifa and other leftist thugs from showing up and creating chaos and committing violent acts anyway. 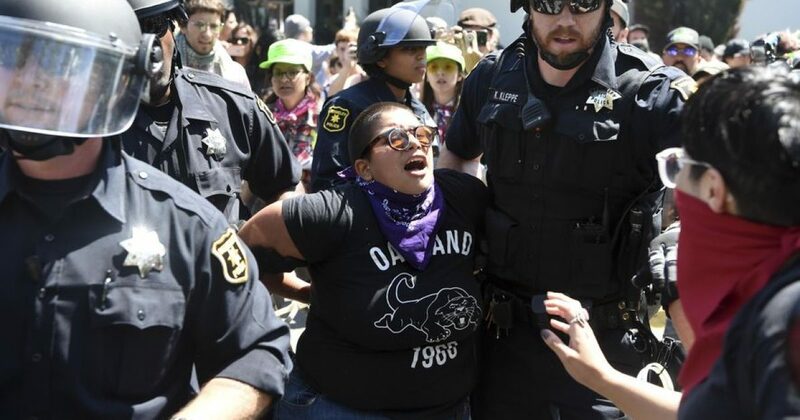 Berkeley police reportedly made 14 arrests Sunday as thousands of counter-protesters flooded Civic Center Park in Berkeley, even though the previously scheduled No to Marxism in America rally had been cancelled the day before, according to The Washington Times. Hundreds of black-clad antifa activists jumped police barricades and tracked down the small number of Trumpsupporters who showed up anyway, beating up at least one man and hitting another with sticks, as shown on video from KCRA-TV in Sacramento. Mr. Gibson cancelled his group’s Freedom Rally before it was scheduled to begin Saturday at Crissy Field in San Francisco, saying he feared it would erupt into a “huge riot” fueled by activists from the antifa and By Any Means Necessary. “Reason has prevailed because the people of San Francisco have demonstrated our determination to protect the freedom of peaceful expression as well as public safety,” said Ms. Pelosi in a Saturday statement to the Mercury News. But Mr. Gibson charged the mayor and Ms. Pelosi with stoking unrest by labeling the event as a white supremacy fest, even though most of the scheduled speakers were not white and Mr. Gibson himself is half-Asian. He also accused the Democrats of hypocrisy on protester violence. “You have a mayor who says that we’re hateful, we’re violent, he doesn’t bring up any specific examples, but he doesn’t mention one word about antifa. Not one word,” he said. The rally was billed as a “day of freedom, spirituality, unity, peace, and patriotism,” and Mr. Gibson gave assurances on Facebook beforehand that “no extremists will be allowed in,” including Nazis, the antifa, the Ku Klux Klan and white nationalists. Even so, he said he was being menaced Saturday by antifa and BAMN activists who followed the Patriot Prayer organizers and used Twitter to announce their whereabouts. Mr. Gibson, who lives in Vancouver, Washington, started Patriot Prayer earlier this year to support President Trump, but has since placed the emphasis on fighting extremism on both the left and right in order to promote peace and unity.